Biomass may be cheap and carbon-neutral, but a solar upgrade of biomass-fired district heating could further improve efficiency and reduce local emissions. For example, solar heat helps avoid having to start up and shut down wood-chip boilers or operate them at partial load. It can even replace backup fossil fuel systems, which provide district heating networks with energy in summer. During a December 2017 webinar, held as part of the Horizon 2020 project SDHp2m…From Policy to Market, experts from Sweden and Austria showed promising case studies for a clever combination of biomass and solar thermal in district heating. Jan-Olof Dalenbäck, Project Manager at CIT Energy Management and Professor at Chalmers University of Technology in Sweden, explained that a small pellet-fired DH network, below 1 MWth of capacity, was usually not the best candidate for solar integration, since it can be shut down and restarted while retaining high levels of efficiency. “If you then add a solar array, including storage – typically the best solution for biomass plant integration – you can’t get relevant benefits from shutting down the boiler. Emission and cost savings are negligible or, at least, not worth it because of the investment needed,” he added. Larger biomass systems, for instance, between 1 and 100 MWth, have the advantage that their boilers run on wood chips. They take more time to be shut down and restarted, while a partial load results in reduced efficiency, for example, below 20 % of nominal power. To prevent partial loading, the systems are usually equipped with a smaller fossil-fuel boiler or buffer storage. Of course, an alternative solution is the integration of a solar thermal field, which can provide a significant boost to boiler efficiency, reducing emissions and costs. 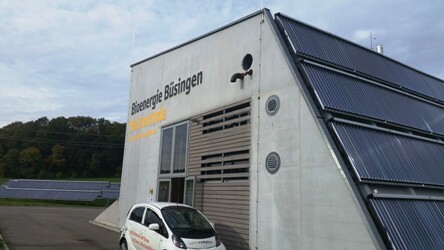 One such biomass-solar system in Sweden is the DH network set up in 2010 in Ellös, in the Västra Götaland county. It consists of 4 MWth of biomass boilers, a 1,000 m² solar array and 200 m³ of buffer storage. The average annual solar fraction is around 10 %, and the main benefit of solar integration is the option to switch off the biomass boiler in summer, except for a few rainy or cloudy days in a row. The size of the solar system is planned to be scaled up to 2,000 m² soon. Solar-assisted biomass DH was quite common in Austria, Moritz Schubert from Austrian-based S.O.L.I.D. said. Sixteen of the 32 SDH plants in operation across the country have been combined with a bio-energy system. Their solar arrays range from 100 m2 to 7,000 m². One factor encouraging these kinds of developments is the national subsidy programme for large solar thermal plants above 100 m². Launched in 2010, it has recently been extended to include plants of up to 10,000 m². It provides 40 % of the investment cost, and both SMEs and designers of innovative systems can get another 5 % on top. Two new SDH systems of between 7,000 m² and 8,000 m² are planned to be set up this year. Schubert also mentioned a biomass-solar DH system in Mürzzuschlag, a town in the northeast of Austria’s Styria region. The plant has solar-based production costs of 35 EUR/MWh, which is slightly below the biomass values of 37 to 38 EUR/MWh. Samuel Knabl from Austrian Institute AEE INTEC said that a survey among DH utilities analysed the main reasons for integrating solar thermal into biomass DH. His interview partners emphasised that solar could replace backup fossil fuel boilers used exclusively in summer to avoid partial load operation. The DH utilities added that solar thermal could also reduce local emissions, such as dust and nitrogen oxides, created during biomass combustion, which would increase public acceptance of biomass DH. Additionally, Knabl underlined that Austria had a programme to recover up to 35 % of the investment in a biomass DH installation. The incentive required that overall network efficiency exceeded 75 % – not an easy objective for small networks in areas of low population density, where long pipes are necessary. Solar thermal could help meet the target. In that case, the biomass incentive could serve as indirect support for SDH systems.